What happened with roses? Did they get a new brand manager or something? A few years ago, rose as a scent was seen as fairly old fashioned and strictly for Turkish Delight bars. There were very few rose scented beauty products and pretty much the only skincare around was the Dr Hauschka Rose Day Cream. But now rose as an ingredient and scent is very much of the moment. You’ll see it a lot in Korean beauty products, where they tend to favour Bulgarian roses. In fact, the very first Korean beauty product I bought was a lovely rose toner by Secret Key. 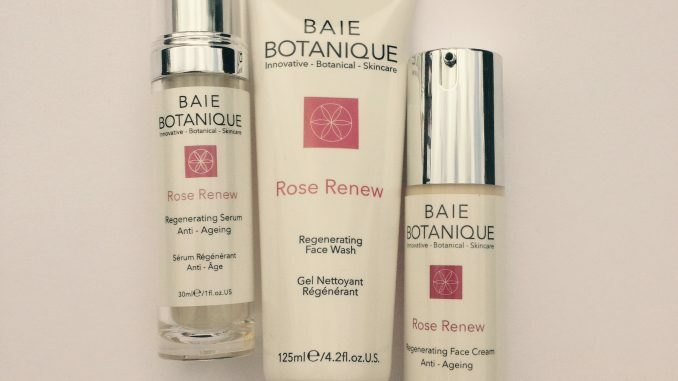 So Baie Botanique are very much on-trend with their range of rose skincare, which we’re looking at today. This is a largely organic botanical skin care range. All of the products are loaded with pure and natural ingredients. They have a high organic content whilst keeping preservatives to a minimum. 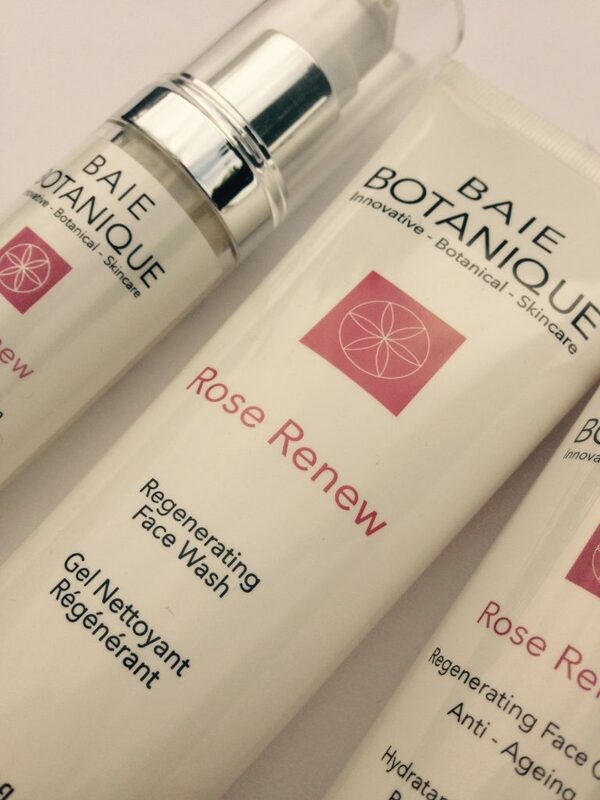 I tried the Rose Renew cleanser, serum and face cream. Because it’s so natural, the scent differs across the range, just as roses do in real life. The serum has the strongest rose scent, but this dissipates quickly. The face cream has a milder scent, but it lasts longer. And the cleanser’s rosiness is kind of in the middle between the two. So it’s a question of whether you like a single stem or the full bunch. This is a nourishing and not at all oily serum, so I think it would pair well with oily skin. Many serums are too rich for oily skin, making this is a welcome benefit. It softens and brightens the complexion, leaving a non-greasy radiance. As well as rose, you also get green tea and Vitamin C in this face wash. It’s a non-foaming gel cleanser which hydrates well enough not to leave the face feeling dry and tight after washing. The gel is kind of like a liquid soap texture, so you get the sensation of washing your face without leaving it parched like soap would. I’ve been using this as a second cleanser, after an initial oil cleanse to remove make up. It really does help to brighten up and refresh the skin. This is the one where the rose scent is initially lighter, but it hangs around thanks to the inclusion of rose water, rose absolute (an essential oil) and rosehip seed oil. It’s an enriched anti-oxidant treatment moisturiser designed to plump, hydrate and replenish the skin. Other active ingredients include glycolic acid, Vitamin C, green tea and peptides. I found it left me moisturised all day – normally I need a bit of extra oil in Winter but this face cream plus the Rose Renew serum was just right. Obviously you’ve got to love roses to enjoy this range. I know some people are allergic to rose so it’s not for absolutely everybody. But if you want a more natural product with plant-based organic ingredients then I think you’ll enjoy this a lot. It might put you in the mood for a Turkish Delight though. 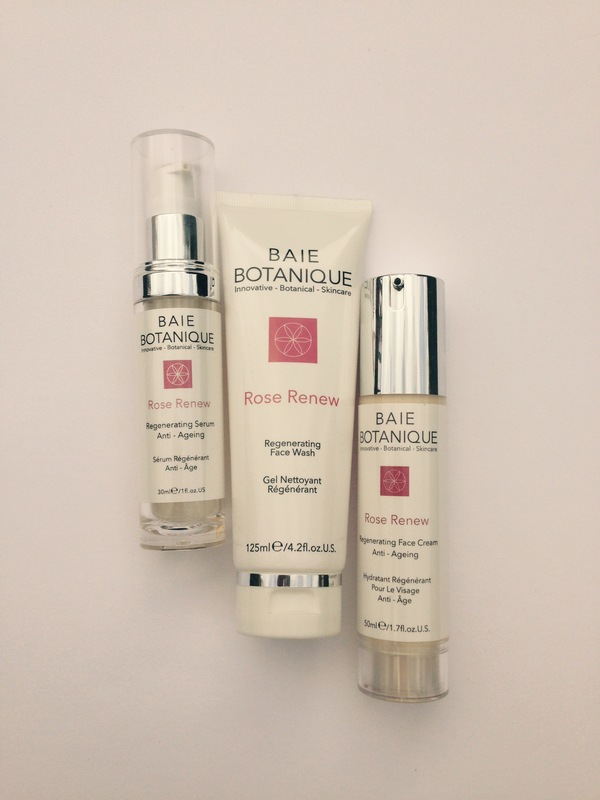 The Rose Renew range is available here on the Baie Botanique website.